With all the high-end hardware requirements typical of VR gaming, you’d think of the Nintendo Switch as the least likely candidate to adopt it. But one of the many things Nintendo is unequivocally good at is making the most of its tech and working within its limitations. The new Labo VR Kit is yet another example. While it doesn’t always overcome its inherent shortcomings, Nintendo’s latest cardboard-based do-it-yourself package cleverly transforms the Switch into a light, inventive virtual reality gaming experience with the tools to go beyond the initial library. First things first: You have to build. Thankfully, assembly is part of the fun. Like the previous Labo packages, the software contains detailed and digestible step-by-step instructions, which are animated to show you how to put everything together without a hitch–the encouraging communication also helps take the edge off the laborious, time-consuming aspect of it all. Construction is almost fool-proof since each cardboard sheet has precisely cut lines and slots for everything to be folded and snapped into place. There’s no denying the satisfaction of seeing little bits of cardboard gradually come together as an intricate device solidly held together by rubber bands, exact creases, and plastic grommets. So, how does the Switch become a VR headset? You first build the mount that contains the slot you slip the Switch into, which also holds the packaged goggles. The mount keeps everything in place nicely and the adhesive pads keep the Switch safe. 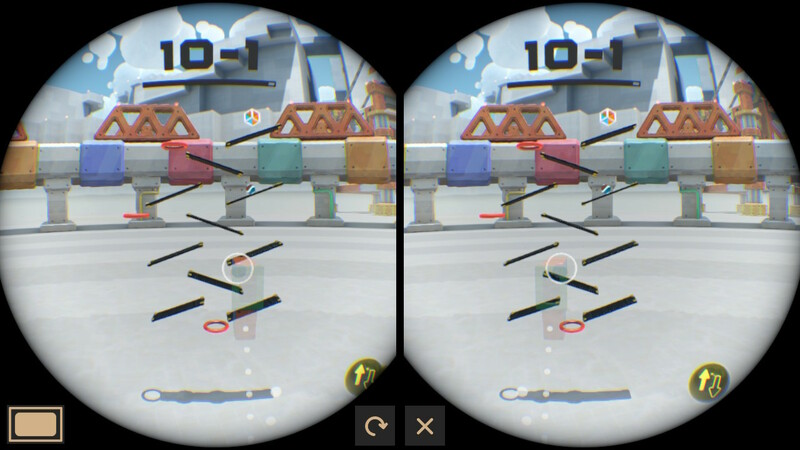 Once you set the Labo software to VR mode, the screen transforms to a stereoscopic view for the lenses. Since there is no headstrap, you’ll need to hold the Switch up to your face throughout your time in VR mode. It’s worth noting that the Switch’s 720p screen resolution is well below that of any other VR platform, resulting in a distinct lack of visual clarity–luckily, this limitation doesn’t detract from the types of experiences Labo VR delivers. With the headset ready to go, you can physically look up, down, left, and right by moving your head. But because the Switch isn’t able to do positional tracking, forward or backward movements aren’t recognized and could be nausea-inducing. Tracking relies entirely on the Switch’s built-in gyroscope and accelerometer, which results in a relatively smooth viewing experience. Looking in and around in VR works pretty well, and in combination with the Joy-Cons’ own gyroscope and accelerometer (and the right Joy-Con’s IR sensor), the cardboard devices become functional pieces of hardware. 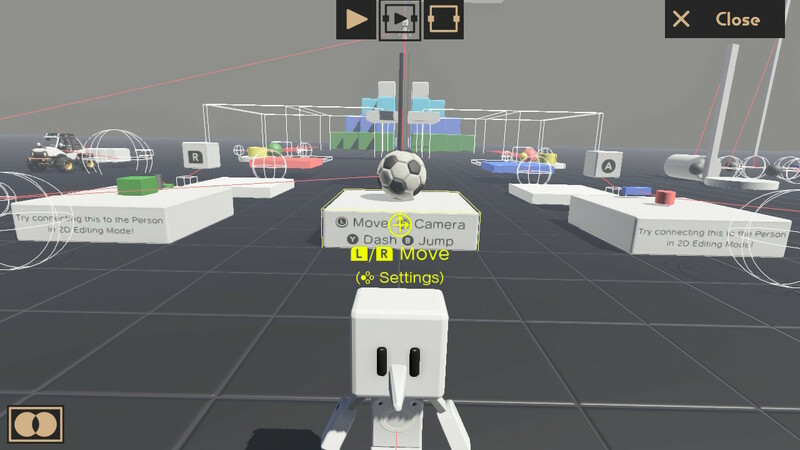 By and large, the creative process is what drives the Labo VR Kit to become more than its packaged contents–but to see that, you should experience its roster of games, minigames, and proof-of-concept sandboxes. Once you’ve assembled a new cardboard toy (called Toy-Cons), Labo then walks you through a specific game made for it. The Toy-Con Camera transports you to the middle of an ocean where you can snap photos of marine life, or look upward to float to the surface and see a bigger world. Twisting the Toy-Con Camera lens works just like zooming in with an actual camera lens because of the Joy-Con placed inside recognizes those small movements. Despite the Toy-Con Elephant being the toughest one to work with, the Marble Run game it’s tied to is a series of smart physics-based puzzles for you manipulate platforms, gravity, and trampolines to get a marble through a goal. The novel applications don’t end there, either. The Toy-Con Bird delivers flight movements for its open-area collectathon and racing game because the Joy-Con, which is placed on the “bird”‘s beak rocks back and forth when you flap the cardboard wings. A personal favorite is the Toy-Con Blaster; it’s a pump gun for with tactile feedback that matches the launching of explosive balls for its on-rails shooter game. There’s impressive cleverness in how Nintendo makes use of the motion-tracking capabilities and cardboard components, and how they translate to sensible control schemes. These aren’t intended to be long-form experiences; rather, they’re bite-sized showcases of VR functionality for each of the cardboard devices you assemble. The Labo VR Kit is much more than just VR gaming for the Switch; it’s educational, accessible, and imaginative, with a robust suite of programming tools. And that’s what makes it wholly unique from anything else on the VR market. On paper, it may seem like a hassle to constantly hold the Switch headset to your face without a strap to hold it in place, but it’s not as bad as it sounds–each Labo VR device is designed with this in mind. Take the Toy-Con Blaster, for example; your view in its rail shooter game is essentially a persistent aim-down-sights, and the ergonomics of the Blaster itself make it a comfortable experience. With the Elephant, you get a handle beneath the cardboard face to hold it up as you extend the trunk to move your in-game hands. And of course, the physical act of holding up the Toy-Con Camera to your face coincides with the real-world action. The content in VR Plaza distills it down even further by isolating certain aspects of each toy’s potential in 60+ minigames/sandboxes. They essentially act as the building blocks for the inventive Toy-Con Garage and this is where the Labo VR Kit lets your imagination run wild–it’s literally the toolset used to program the minigames contained in the VR Plaza section. 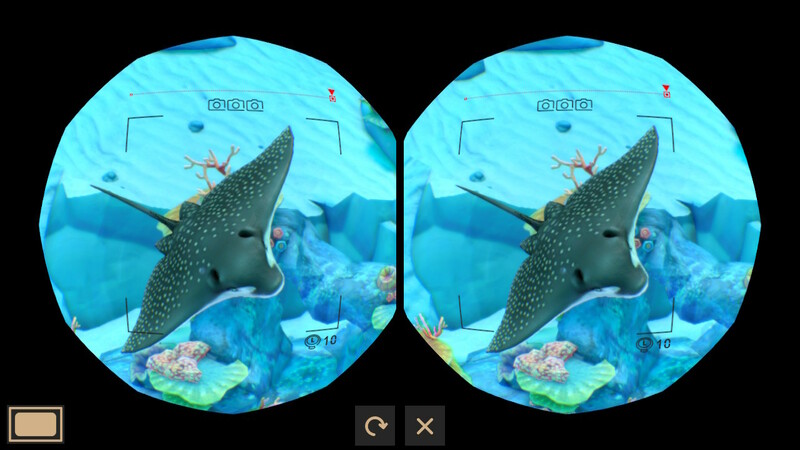 It’s a part of previous kits as well, but this version adds tools to create VR experiences. 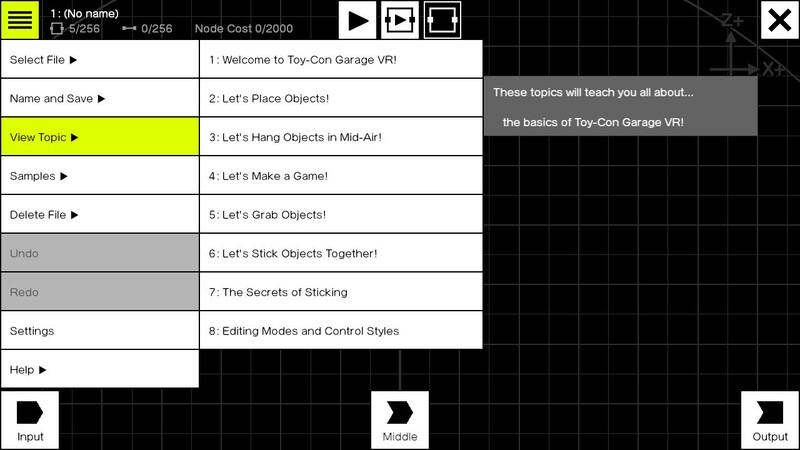 Toy-Con Garage is extremely complex and much more than a level creator you may find in other games. It’s possible to teach yourself and eventually get to a point where you can wrap your head around the logic and programming for something and see it come to fruition, but it’ll take significant time and effort if you don’t have prior experience with programming. What’s neat is that you can edit every sandbox/minigame in VR Plaza using the Garage tools and basically use them as the foundation to create your own thing. 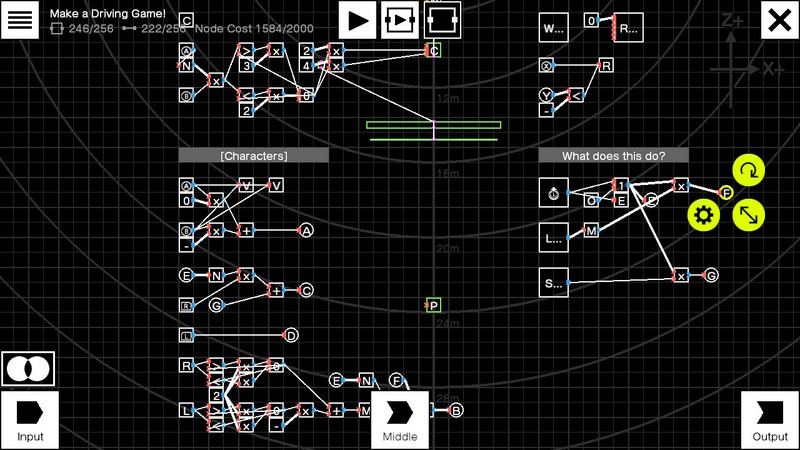 By virtue of seeing the programming guts of each game, you can then start to unravel how they’re built. 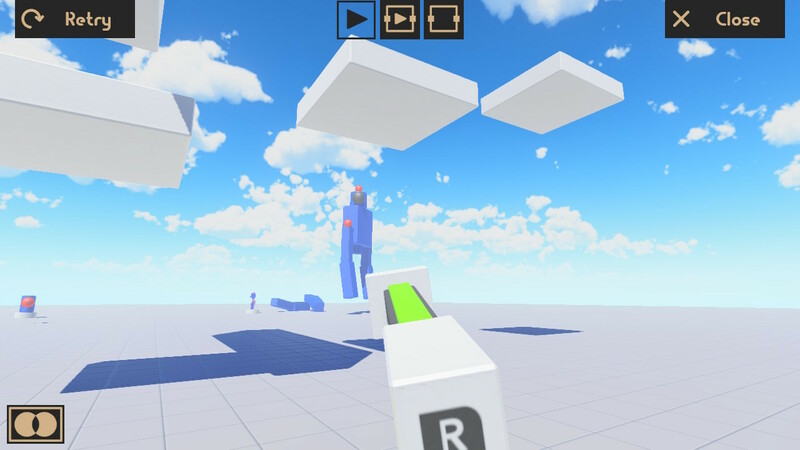 Things like Make An FPS Game and Make An Action Game in VR Plaza are specifically designed to let you use them as templates. 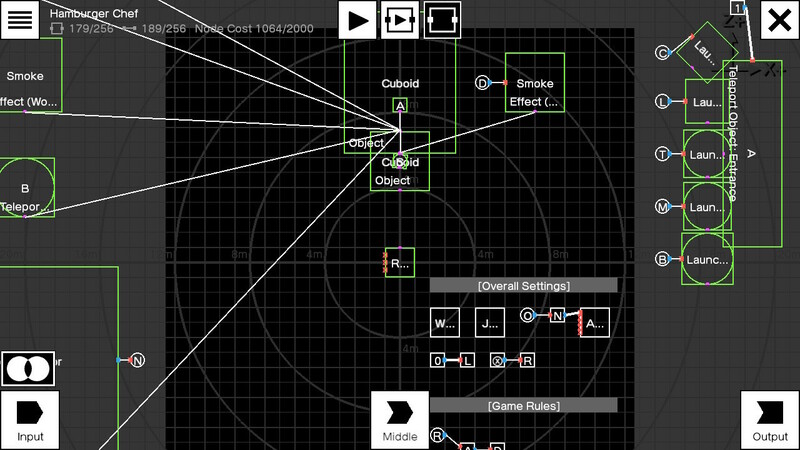 And editing doesn’t have to be solely done in VR thanks to the ability to select a 2D editing mode. Like the other kits, the Labo VR Kit does so many great things outside of its more standard game experiences, and it’s really about what you do with the technology. 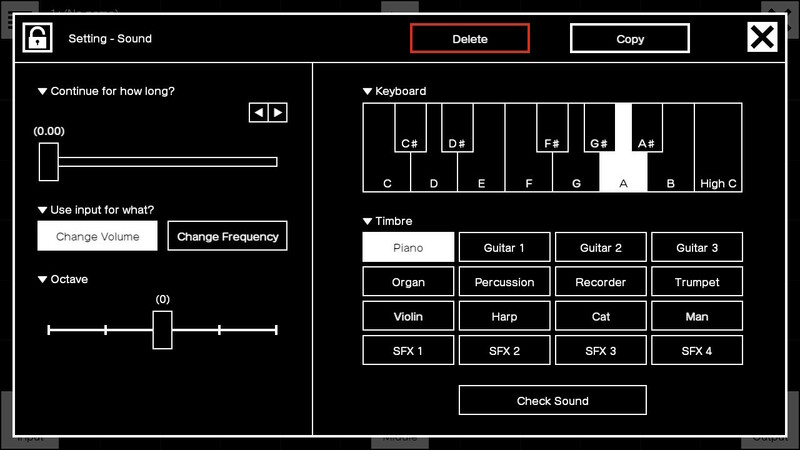 In addition to the games and programming tools, Discovery Mode works as a laudable educational tool. 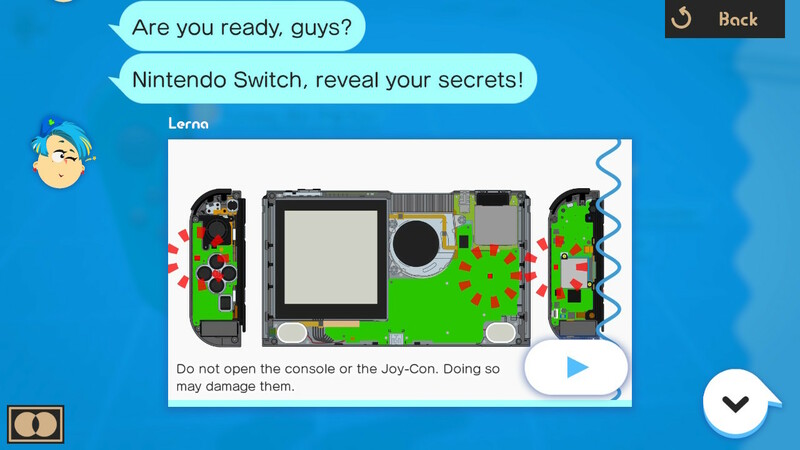 Discovery offers a series of cheeky dialogue scenarios between a few Labo-based characters that effectively walk you through the Switch’s technology, asking you questions along the way to make sure you’re keeping up. 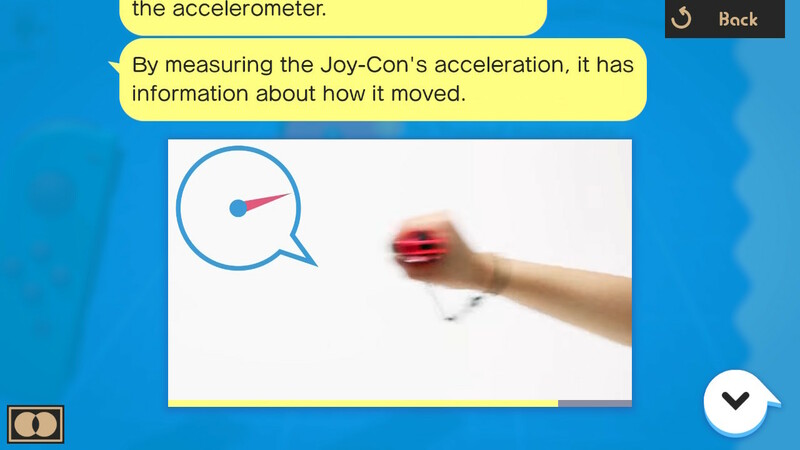 Think of it as a crash course in physical science and electronics that explains everything from how the right Joy-Con’s IR sensor works to showing you why gyroscope drift happens. Not only does Discover further contextualize what the hardware is doing, but makes knowledge of complex tech accessible to a wider audience. However, there are a few cases in which the Joy-Con tracking can be frustrating due to gyroscope drift. It’s fairly easy to constantly recalibrate the Joy-Con position in a free-hand experience like shooting hoops, hitting a ball with a paddle, or moving blocks in a 3D space. But it becomes an issue in something like the Doodle application or the Marble Run stage creator, where you have to use the Elephant to craft a 3D sculpture or build a course, respectively. Your plane will always drift off-center. You can recenter yourself by accessing the pause menu, but it’s frustrating to frequently wrestle with the motion-tracking in these cases. As a result, it’s difficult to keep your work consistent and gets in the way of certain parts of the creative process with VR mode. The Labo VR Kit is much more than just VR gaming for the Switch; it’s educational, accessible, and imaginative, with a robust suite of programming tools. And that’s what makes it wholly unique from anything else on the VR market. Despite all its limitations and seemingly makeshift appearance, each contraption is an example of a creative vision in action, most of which works exceptionally well in bite-sized portions. In a broad sense, Labo VR is a smart, clever use of existing tech and expertly designed cardboard devices. The biggest factor in the lasting appeal of Labo VR (and the Labo lineup in general) lies in the Toy-Con Garage, because there’s no denying the barebones aspect of the packaged gaming content, which is more of a collection of proofs-of-concept for VR’s potential. 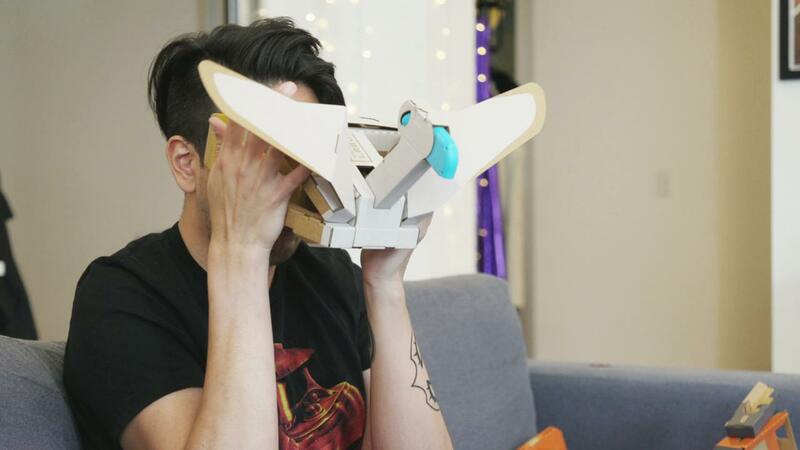 Like the other kits, the Labo VR Kit does so many great things outside of its more standard game experiences, and it’s really about what you do with the technology.